The EU’s East StratCom Task Force was set up by EU High Representative Federica Mogherini in 2015, in response to a request from all 28 EU Heads of Government to “address Russia’s ongoing disinformation campaigns”. It is a team of eleven communications and Russian language experts, who also seek to improve communication on EU policies towards the Eastern Neighbourhood and to strengthen media plurality in the region, especially in the Russian language. The Task Force’s flagship products are its weekly Disinformation Review of pro-Kremlin disinformation stories and its social media accounts @EUvsDisinfo and EU vs Disinformation. 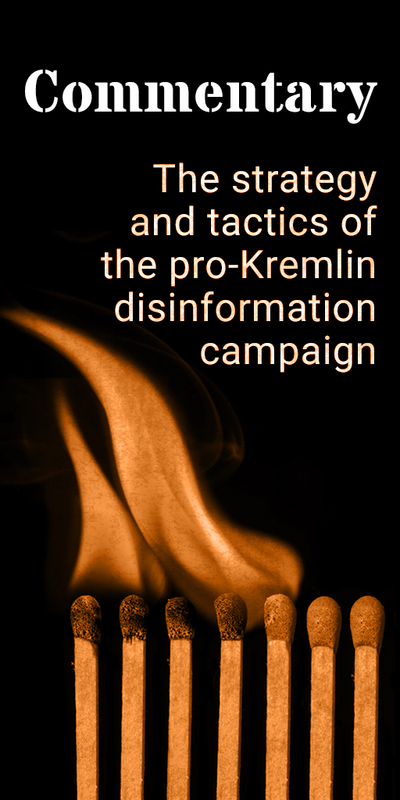 There is no doubt that the pro-Kremlin disinformation campaign is an orchestrated strategy, delivering the same disinformation stories in as many languages as possible, through as many channels as possible, and as often as possible. Our conclusion is based on 15 months of daily collection of data on disinformation: more than 2,500 examples in 18 languages of stories contradicting publicly available facts, multiplied in many languages and repeated on a daily basis. This is also the conclusion of many experts in this field, such as journalists from StopFake, who regularly catalogue fake news and expose how a particular piece of disinformation gets spread and multiplied via various channels and languages (see a case study of this phenomenon). The disinformation campaign is a non-military measure for achieving political goals. Russian authorities are explicit about this, for example through the infamous Gerasimov doctrine as well as through statements by top Russian generals that the use of “false data” and “destabilising propaganda” are legitimate tools in the tool kit. The Russian Minister of Defence describes information as “another type of armed forces”. Russian journalists were awarded Presidential medals for misrepresenting events in Crimea. The aim of this disinformation campaign is to weaken and destabilise the West, by exploiting existing divisions or creating artificial new ones. Those divisions can be on the strategic level: for example the EU versus NATO/US (where NATO/US is frequently described as an occupying power in European countries), or differences between EU Member States (typically on the issue of Russian sanctions). They can also be on a local level, exploiting minority issues or the fear of refugees. Among the artificial divisions, a conflict between basic human rights and traditional values is often used. Often, outright lies are deployed, aimed at denigrating a particular person (1), political group, government (2) or intergovernmental organisation (3), as well as NGOs, mainstream media, elites, experts, the “establishment”, and those taking initiatives to counter disinformation. Another strategy is to spread as many conflicting messages as possible, in order to persuade the audience that there are so many versions of events that it is impossible to find the truth. Particularly obvious examples include the clear obfuscation over the downing of flight MH17, Boris Nemtsov’s assassination and the bombing of a humanitarian convoy in Syria. What are the tools of disinformation? We do not have a complete overview, as there is still not enough systematic research. What we do know, thanks to our own Disinformation Review as well as local activities like StopFake and Kremlin Watch, is that not only big media outlets like RT or Sputnik are deployed, but also seemingly marginal sources, like fringe websites, blog sites and Facebook pages. Trolls are deployed not only to amplify disinformation messages but to bully those, like Finnish journalist Jessikka Aro, brave enough to oppose them. And the network goes wider: NGOs and “GONGOs“ (government organised NGOs); Russian government representatives; and other pro-Kremlin mouthpieces in Europe, often on the far-right and far-left (4). In all, literally thousands of channels are used to spread pro-Kremlin disinformation, all creating an impression of seemingly independent sources confirming each other’s message. The impression we have – though again, more research is needed – is that different tools have a different degree of importance in different regions. Targeting the Russian speaking minority seems the most important tool in the Baltic states, whereas in Central Europe it seems to be the use of dozens of “alternative“ websites, while trolling seems most prevalent in Scandinavia. What is the influence of the disinformation campaign? Again, we cannot be sure, without looking inside the heads of individual citizens and voters and seeing what influenced their opinions and decisions. But a disinformation campaign, just like any other PR campaign, works over time by building familiarity with and acceptance of its messages, through multiple channels; sowing mistrust in mainstream media, authorities, or any solid sources of information in general. 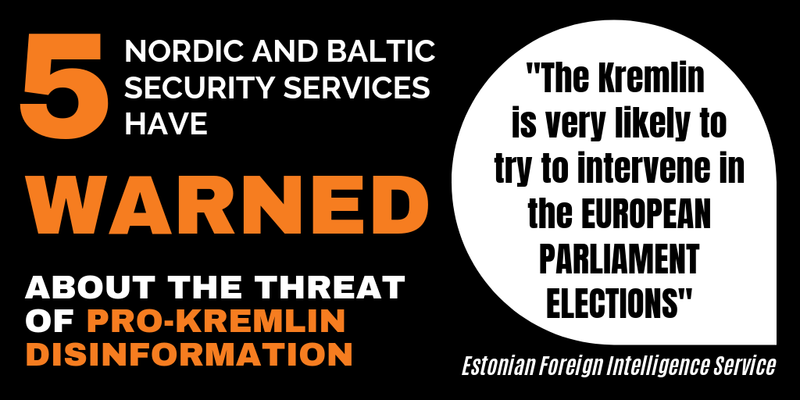 Looking ahead to 2017, both Germany and France are already warning of the threat of disinformation attacks on their elections, while several European security services have spoken openly about the threat of hostile Russian disinformation activities. Is the disinformation campaign successful? Definitely yes. Just as the purpose of a campaign run by a car brand is not to make the consumer like their advertisement in this or that magazine, but to buy the car, similarly the purpose of a disinformation campaign is not to make consumers like the outlets but to buy the disinformation message as credible information. And many of us are buying. If we look at those few focused opinion polls measuring how many people accept an obvious disinformation planted in pro-Kremlin media (5), we have to conclude that the disinformation campaign is extremely successful. It’s incumbent on us all to be more careful what we consume. (2) E.g. Ukraine: Disinfo Review 50 or Disinfo Review 45; Baltic states: Disinfo Review 49; Disinfo Review 12/01/2017; Poland: Disinfo Review 48; Finland: Disinfo Review 47; Austria: Disinfo Digest 11/11/2016 and Disinfo Digest 04/11/2016; Hungary: Disinfo Review 46; Denmark: Disinfo Digest 28/10/2016; US: Disinfo Review 41 or Disinfo Review 39. (3) See e.g. fake stories about Ukraine and/or EU building/funding concentration camps for Russian speaking people in Ukraine: http://www.stopfake.org/en/fake-concentration-camp-for-separatists-under-construction-in-donetsk-region/; http://www.stopfake.org/en/the-ministry-of-internal-affairs-of-ukraine-rebuts-the-information-about-construction-of-concentration-camps/; http://www.stopfake.org/en/russia-s-top-lies-about-ukraine-part-3/; pro-Kremlin disinformation in Georgia targeting the EU and NATO: Disinfo Digest 23/09/2016; EU accused of granting visas based on skin colour: Disinfo Review 31; EU accused of forcing people to become gays: Disinfo Digest 17/06/2016; NATO regularly being accused of planning an invasion of Russia: Disinfo Digest 08/07/2016, or Disinfo Review 31. (4) To read more about multiple tools of the pro-Kremlin disinformation campaign in Europe and its links to Russia, see e.g. „Agents of the Russian World“ by Chatham House; „Putin’s Propaganda Machine“ by Marcel van Herpen; „Mechanisms of Influence of the Russian Federation“ by European Values; „The Bear in Sheep’s Clothing“ by Wilfried Martens Center. To read more about the links between European extremists and Kremlin, see e.g. https://www.theatlantic.com/international/archive/2016/12/russia-liberal-democracy/510011/, or follow the works of Political Capital (http://www.politicalcapital.hu/index_gb.php), or Anton Shekhovtsov (http://anton-shekhovtsov.blogspot.com). (5) See http://www.cepolicy.org/sites/cepolicy.org/files/attachments/glb_trends_en.pdf, and https://euobserver.com/foreign/129237. Similar conclusions to be seen e.g. https://www.buzzfeed.com/craigsilverman/viral-fake-election-news-outperformed-real-news-on-facebook?utm_term=.mlLn14XQw6#.ibyDVq2La5, https://www.washingtonpost.com/business/economy/russian-propaganda-effort-helped-spread-fake-news-during-election-experts-say/2016/11/24/793903b6-8a40-4ca9-b712-716af66098fe_story.html?postshare=3851480055188585&tid=ss_tw-bottom&utm_term=.e093aa6964d5, https://interaktivni.rozhlas.cz/dezinformace/, http://nymag.com/selectall/2016/12/why-people-believe-obama-encouraged-illegals-to-vote.html?mid=twitter_selectall. Disclaimer: This paper contains the expert view of the East StratCom Task Force and does not reflect official EU policies. The commentary was originally published by the Italian Institute for International Political Studies (ISPI) You can view it online here.